"Atomic blasts on the Earth, Atomic activity on the moon, the two facts add up." Commando Cody and his associates have been given the task to discover who is behind the current reign of destruction. Retik, ruler of the Moon, has sent his henchman Krog to attack Earth's defenses in preparation for an invasion of the Earth. Cody narrowly escapes being blasted by diving out of of the line of fire at the last moment. Cody escapes from the Moon city and flies back to the rocket. Cody seeing the bomb on the bridge, jumps from his speeding car to safety. Running short of funds, Krog pressures Graber into robbing a bank. The attempt fails and Graber and another henchman make their escape. Before the plane crashes, Cody helps Joan on with a parachute and she parachutes to safety, Cody flies out to the plane and insures Joan is ok. Graber thumbs a ride to town as Cody spots him and he flies after him. Graber forces the driver to keep driving and opens fire on Cody. Cody and Ted jump from the car in the nick of time. Graber recovers the payroll. Retik orders Krog to drop an atomic bomb in a dormant volcano and intensify ray gun attacks. As Cody is falling he turns on his rocketpack and flies to safety. Cody returns to his office and then proceeds to Al's cafe where he meets a auto mechanic which referred Graber to another shop for truck repairs. As Cody is examining Graber's truck, Graber and Daly enter and a fight commences. Moments before the plane is destroyed, Ted, with a parachute, and Cody bailout of the plane. Back at Cody's office, Cody informs Mr. Henderson that he'll return to the Moon. 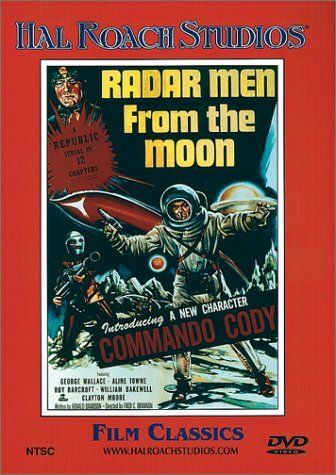 Upon landing on the Moon, Cody flies out on a scouting expedition. Finding a Moon sentry, Cody overpowers him by shutting off his oxygen supply on his space suit and takes him prisoner. Ted drops hand grenades on the pursuing tank disableing it. Ted returns to help Cody and finds him unconscious. Once he revives Cody he again goes out to distract the Moon men so Cody can finish the repairs. Cody and Ted return to their space-ship and unload the Lunarium. Cody takes refuge under a cliff overhang and as the rock fall past him. Cody's ship has now landed so Graber and Daly take off. Retik disappointed with Krog's incompetence, is flying to Earth to take charge of operations. Just as Cody is about to fall, he pushes an alarm button summoning the police. who get the door open and remove Cody, Joan and Mr. Henderson from the improvised gas chamber. Graber and Daly, believing they are successful, drive from the scene. Cody and Joan emerge for the office building and commander the police car and head off in pursuit. Cody falls to the ground from the electric shock and Retik announces to Graber and Daly to continue the plans. Cody regains consciousness after the thugs leave, His suit had grounded the charge and spared his life. Cody receives a phone call from Al's cafe that Graber and Daly are meeting with some other men and planning something.